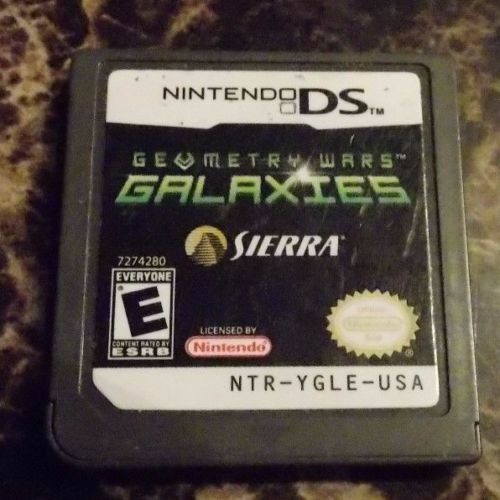 The Xbox 360's retro-themed shooter series thrusts onto DS with Geometry Wars: Galaxies. Inspired by classic arcade titles like Asteroids and Tempest, the game mixes vector graphics and non-stop blasting action within colorful, grid-shaped solar systems. The controls attempt to mimic the dual-analog system of earlier versions by using the stylus as a pointer for 360° aiming and the Control Pad for movement. Blasting enemies will leave behind items called Geoms that increase bonus multipliers for high scores. One of the biggest changes to the series is the inclusion of a drone ship companion, which can be ordered to attack, collect Geoms, deploy defensive turrets, and perform other strategic options. 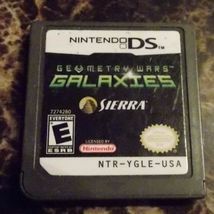 Four multiplayer modes are available for both competitive and cooperative action with a friend, and Galaxies supports connectivity with the Wii version for bonus content. The full version of Geometry Wars: Retro Evolved is also included as a special bonus.